1966 The goat stood until midnight of New Year’s Eve, when it went up in flames. 1968 …it is said that one night a couple made love inside the goat. 1969 The goat was burnt down on New Year’s Eve. 1970 The goat burnt down only six hours after it was assembled. 1972 The goat collapsed because of sabotage. 1976 Ran over by a car. 1978 Again, the goat was kicked to pieces. 1979 The goat was burnt even before it was erected. 1980 Burnt down on Christmas Eve. 1982 Burnt down on Lucia (December 13). 1983 The legs were destroyed. 1984 Burnt down on December 12, the night before Lucia. 1985 Even though the goat was enclosed by a 2 metres (6.6 ft) high metal fence, guarded by Securitas and even soldiers from the Gävle I 14 Infantry Regiment, it was burnt down in January. 1986 The big goat burnt down the night before Christmas Eve. 1987 A heavily fireproofed goat was built. It got burnt down a week before Christmas. 1989 Again, the goat burnt down before it was assembled. 1991 On the morning of Christmas Eve the goat was burnt down. 1992 The goat was burnt down eight days after it was built. 1995 Burnt down on the morning of Christmas Day. 1998 Burnt down on 11 December, even though there was a major blizzard. 1999 Burnt down only a couple of hours after it was erected. 2000 Burnt down a couple of days before New Year’s Eve. 2001 Goat set on fire on 23 December by Lawrence Jones, a 51-year-old visitor from Cleveland, Ohio, who spent 18 days in jail and was subsequently convicted and ordered to pay 100,000 Swedish kronor in damages. 2002 The goat received only minor damage. 2003 Burnt down on 12 December. 2004 Burnt on December 21. 2005 Burnt by unknown vandals reportedly dressed as Santa and a gingerbread man by shooting a flaming arrow at the goat at 21:00 on 3 December. 2008 The goat finally succumbed to the flames ignited by an unknown assailant. 2009 An unsuccessful attempt was made to throw the goat into the river the weekend of December 11. 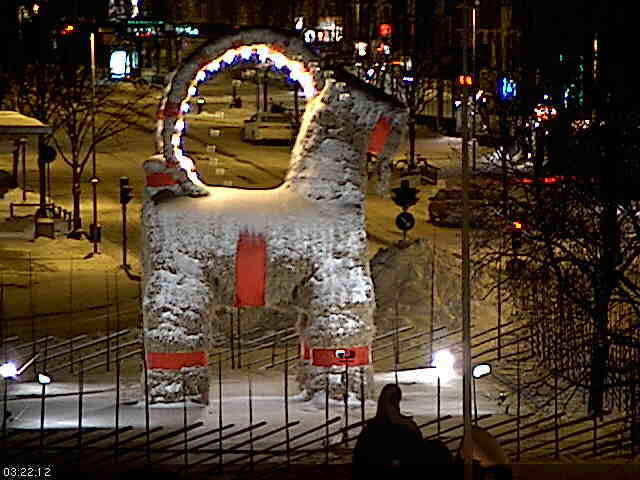 On the night of December 23 before 04:00 the goat was set on fire and was burned to the frame, even though it had a thick layer of snow on its back.The goat had two online webcams which were put out of service by a DoS attack, instigated by computer hackers just before the attack. 2010 Both goats survived this year and were dismantled and returned to storage. 2011 Fire-fighters sprayed the goat with water to create a coating of ice in hopes of protecting it from arson. The goat burned down in the early morning of 2 December. There is once again a webcam for this year’s goat, if you would like to help keep an eye on it. What does the ill-fated goat’s future hold for 2010? A live feed of a box of puppies. If this doesn’t make your day feel just a little bit better, you have no soul. After going through a time change, an emotional presidential election, an 800-point-two-day drop in the Dow, and Halloween all in one week, it feels nice to know that these guys didn’t even notice. The Eye on Colorado page contains links to all Colorado Ski Resort Webcams, I70 & CDOT Webcams, CDOT Mountain Pass Status, Weather Reports, and the CAIC Avalanche Danger Rose. The links and information should give the user a complete picture of the current dangers and status of Colorado’s Mountain terrain including roads resort and back country. I’ll be checking this site often.